An image-text pairing from my Excerpts series appears as a part of VerySmallKitchen’s contribution to the exhibition A Pigeon, A Kitchen and an Annexe: Sites of Alternative Publishing at Five Years in London, UK. The nostalgic gesture of intentionally translating an up to date medium into its low-fi predecessor is the starting point for this exhibition: why use letraset when you can pick up any font off a drop down menu? Why publish books in the age of WordPress? A Pigeon, A Kitchen and an Annexe: Sites of Alternative Publishing invites you to step into the world of a bustling “press room” devoid of wi-fi: a scene created specifically for this show. For this exhibition The Ladies of the Press* invites Annexe Magazine, Pigeon Magazine, and VerySmallKitchen to probe their practice as alternative publishers in a gallery context, collectively working towards multifarious outlets including a gallery exhibition, a publication, talk, and eventually a web based dispersal. 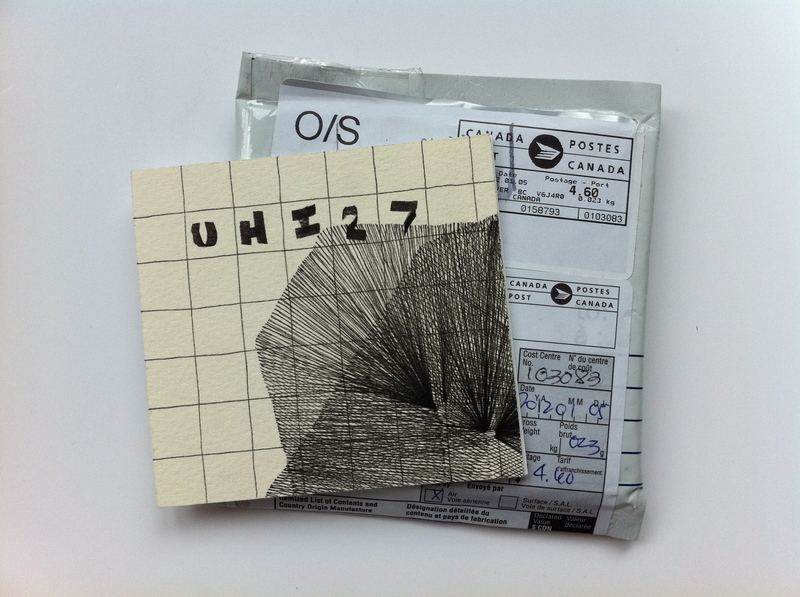 I think one starting point for this project was the small card you sent me of one of the image-text pieces from your residency on the VerySmallKitchen blog. I was interested in the equal emphasis on both sides of this card (the image on one side/text the other), and how – unlike the blog post’s downward scroll – to read the card required turning over, one side concealing the other in order to be comprehended. 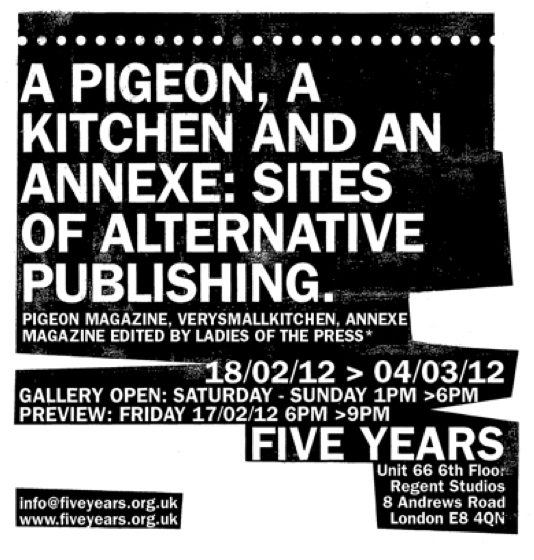 A Pigeon, A Kitchen and an Annexe: Sites of Alternative Publishing is on view till March 4, 2012 at Five Years. The gallery is open Saturday-Sunday, 1-6pm and is located at Unit 66, 6th Floor, Regent Studios, 8 Andrews Road, London, UK, E8 4QN. Opening Reception: Tuesday April 19th, 5-8pm. Gallery Hours: Monday to Saturday, 11am-4pm. 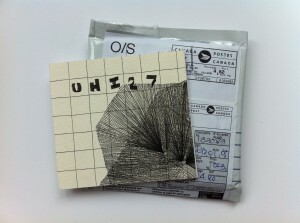 UBC SUB Gallery, 6138 Student Union Blvd, Vancouver, BC V6T 1Z7 (Map). “Picturing Intuition” is an exhibition that highlights the connections between intuition and the element of time in the process of making, exhibiting and experiencing art. This applies to the individual pieces in the exhibition, to how the artworks engage with each other and interact with the space of the gallery and, more importantly, to how they connect with the viewers’ own intuition through their sense of time. Art works are images, objects, assemblages and events that take up a specific space, but they also possess invisible and unbound temporal qualities. The act of encountering art in a gallery associates the viewers’ present and conscious time to the temporality embedded in the works of art and that of the space of the exhibition. It provides the connection through which the visuality of the work in relation to the space it occupies can then be experienced. Without the establishment of this connection, no image or impression can find a place or meaning in the viewers’ consciousness. The relationship between intuition and temporality is not void of politics. Often the establishment of social intersubjectivity is impossible unless it is guaranteed, beyond logic and language, through the process of indirect swaying and influencing of subject’s intuition through the sense of time. 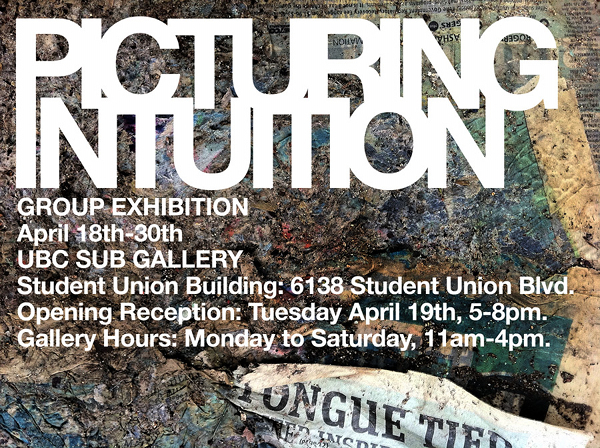 “Picturing Intuition” is curated by Mo Salemy.